On twitter, @ReelTalker aka Candice raised the topic of Young Adult and this offers us the opportunity to talk about a movie that I love as well as a larger topic about leading ladies in 2011. First, Young Adult was very high on my 10 best list. I am a huge fan of Jason Reitman and Diablo Cody and the role that they created for Charlize Theron is one of the most unique and challenging roles given to anyone in 2011. Theron is bold and courageous in the way she so blindly charges forward with her atrocious behavior. Theron and Patton Oswalt had awesome comic chemistry and their final scene together, I don't want to spoil anything, is a heartbreaking and revealing moment that they both nail perfectly. As has been the case for seemingly a decade at least, there were a paucity of good roles for women in 2011. 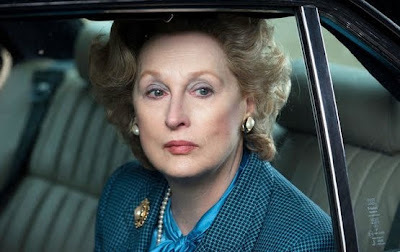 Meryl Streep delivered, as she always does, with a completely engrossing performance in The Iron Lady. 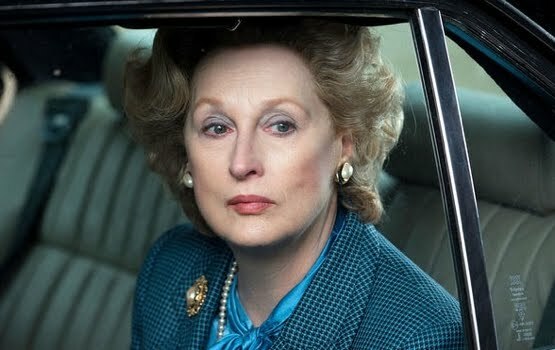 That's not to say that The Iron Lady is a great movie, it's not, but Streep delivers everything asked of her in a movie that too desperately apes the Oscar pretentions of The King's Speech. Adepero Oduye was extraordinary in Pariah and deserves Oscar consideration. Her performance as a slowly coming out of the closet African American teenager dealing with first love, and coming out in an environment she knows won't accept her is devastating and yet hopeful. Michelle Williams inhabited Marilyn Monroe in ways that few actresses ever could. Williams captured the manipulative starlet and the shy, sad little girl sides of Marilyn in a full bodied performance that never lapsed into mere mimicry. Underestimated among leading ladies in 2011 is the performance of Kristen Wiig. Overshadowed by the equally good break out supporting performance of Melissa McCarthy, Wiig has only recently, thanks to the Golden Globes, been getting her due for what is one of the funniest performances, male or female, of 2011. Bridesmaids leads me to another topic, the state of comedy in 2011. Young Adult, Bridesmaids and The Big Year were my favorite comedies of 2011. And, I am in the great, great minority of people who liked The Hangover Pt. 2. 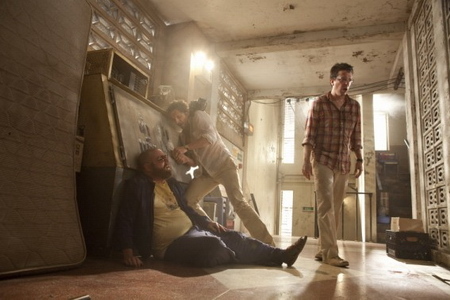 Yes, Hangover 2 is basically the same movie as Hangover 1 but I loved that too so I didn't mind watching a facsimilie. Also among the funniest movies of the year is The Muppets. Jason Segal absolutely nailed the script for The Muppets combining family friendly gags with smart comic moments for moms and dads. The Muppets was so good that even many of the most snarky net critics and tweeters showed the film some love. One of the most overlooked and, I believe, unfairly maligned comedies of 2011, was The Sitter with Jonah Hill. People decided they hated this movie before they saw it and never gave the film a chance. Being a fan of Jonah Hill, I was more hopeful and open minded and I was rewarded with a very funny movie in which Jonah Hill acts like a slightly older version of his Superbad character, delivers many of the same kind of raunchy gags and is just plain funny doing it. You have to be a fan of Jonah Hill and his typical schtick to like The Sitter and since I am, I really liked that movie. Jonah Hill leads me back to a topic that Julian raised yesterday about Jonah Hill's Oscar chances for Moneyball. Here again, I feel, anti-Jonah Hill bias is effecting many people's opinions of his performance. Hill's character is pivotal in making Moneyball work and without him Moneyball is not an Oscar contender. Thus, I think Jonah Hill is very deserving of Oscar consideration for Moneyball but people won't vote for him because they don't like his schtick and they assume he isn't a very good actor. The Jonah haters will miss the quiet nuances that Hill brings to his character, the great chemistry he has with Brad Pitt and the very unshowy way Hill cedes the spotlight to Pitt in the way the best supporting players do. 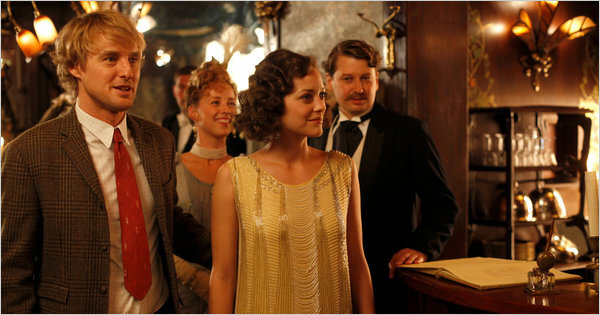 Coming up, we must talk about my favorite movie of 2011 Midnight in Paris. oh, it's time to talk about the femme fatales! The cinematic vixens! To be honest, for the past few years I've really found it hard to come up with five mind-blowing performances from women in cinema each year. But this year I've been really impressed with the diversity of some of the female performances I've seen. Sean, I love that you bring up Young Adult. I have said time and time again that I love how Diablo Cody is one of the most fearless female writers around right now. She basically gives a full storyline to a villain and made a movie surrounding her life, not a movie where she is simply a part of it. That in and of itself has the potential to alienate audiences who don't want to see something that stark, so unaffected. But I think Charlize humanized this character. While she wasn't exactly redeemed in the movie (which is what i liked most about it), Theron tapped into the inner core of the character. It was clear that she understood her. Mavis Gary needs an actress who can really be a friend to her, not one who abuses her and plays her for face value. Theron did her justice. While the movie isn't exactly earth shattering, I think the way it was told, and Theron's portrayal catapulted this movie into my top ten list. But I have to say, I wasn't too blown away by Patton Oswalt. But I did like him in the role. I'm curious to see where his career goes after this. I love Meryl Streep as an actress. I really do, and probably always will. But she really has been phoning in the last couple of performances I've seen her in, to me. The last great performance I've seen from her is in The Devil Wears Prada. Since then, I don't think her performances have been bad (let's face it: her worst performance is some actresses' best), but I think she has been better. Her performances (or maybe the roles?) have been blending in together to the point that they're all starting to look the same. She's fine in The Iron Lady, but some of her mannerisms made me think of those she did in both Julie and Julia and Prada. While I liked the way the story of The Iron Lady was written, like you mentioned, Sean, that movie could have used some jumper cables at times. It just kind of floated along and came off a bit stale at time. But the scenes with Jim, Broadbent and Streep together were beautifully touching. 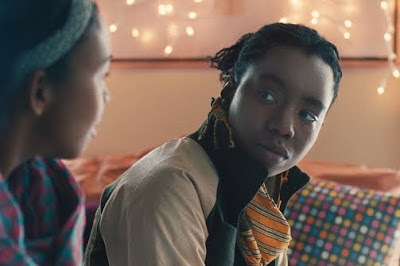 Adepero Oduye in Pariah is one of my favorite female performances this year. She wide-eyed but bold, and you sympathized with her without feeling heavy afterward. She brought you so into the character that you cried when she cried, laughed when she laughed, and was angry for her at times. Pariah is one of my favorite movies of the year. I also want to talk about Rooney Mara in The Girl with the Dragon Tattoo and Keira Knightley in A Dangerous Method. While the movie seems to polarize critics, David Fincher's The Girl with the Dragon Tattoo really proved to me that many American audiences might not be ready for the kind of story Dragon is. It's cold, at times heartless, and never heartfelt. Mara's Lisbeth Salander is victimized, but never a victim. In short, she's totally disaffected, which makes her strange to audiences. It also doesn't help that her look--covered in tattoos, piercing, shaved eyebrows--also pushed away critics. Lisbeth is not your typical heroic character, which makes me like her more. She doesn't seek out heroism, she almost falls into it. I think Mara did a fine job in the role. To me, not as fierce as Noomi Rapace in the original Swedish version, but still good. I was totally with Fincher in the movie, until that sloppy ending. Knightley was so gripping in A Dangerous Method. She holds on to you tight throughout that whole movie. Her wild nature is often trapped between her genius and the aggressive love she has with the idea of being in love. She literally has two of the soundest minds in history nearly collapse on account of her mesmerizing but chilling philosophies. I wish people would talk about her performance in that and Last Night as well. Those were two very different and very wonderful roles she played that got swept under the rug. I know folks want to call Bridesmaids the female Hangover, but it was so much more than that. For starters, Bridesmaids had heart. Kristin Wiig was so nuanced, and Melissa McCarthy was also ace in the movie. While I didn't see The Sitter, the trailer didn't grab me. It just seemed like a raunchier Adventures in Babysitting to me. To be honest, Jonah Hill isn't a draw for me....yet anyways. If we're talking comedies, I'd like to also include my two cents on one of the funnies movies I've seen all year--Attack the Block. Hilariously acted, thought wonderfully nuanced at the right times, this movie was entertaining from start to finish. John Boyega leads a rowdy group of teenage hoodlums in the sci-fi flick with a soul. I adored it. I agree with you, Sean, The Muppets was so cuddly and funny at times. 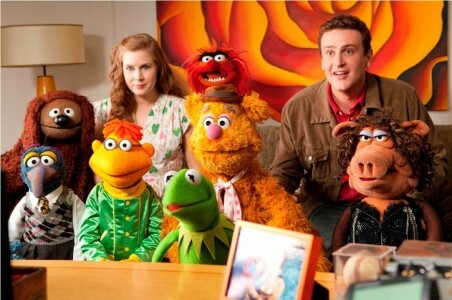 Jason Segel makes it so modern, yet nostalgic at the same time. It was such an endearing movie. While I don't think it's Oscar worthy, I do think the Golden Globes could give it some love. I just didn't love Amy Adams in the movie; she's a real hit or miss to me. But, on the other hand, I couldn't imagine anyone else playing the role...Go figure. The conversation’s shifted to comedies, and appropriately so: after a lackluster showing for laughers last year, quality comedies made a huge comeback this year with Bridesmaids, Crazy, Stupid, Love, Midnight in Paris, The Muppets, and Young Adult. I’m stunned that people have fallen in love with Midnight in Paris, but I can’t complain about a genuinely delightful comedy with a tight ensemble cast. I have to be the odd one out here and say that I didn’t care much for The Hangover, Part II, and this is coming from one who really enjoyed its predecessor. The same tricks that were employed this time around didn’t carry the same humor for me. There's also The Muppets, which I found to be an absolute delight. Jason Segel and Amy Adams were perfect together. Adams is still the go-to girl for cutesy and innocent roles, even after her dramatic turns in Doubt and The Fighter. As long as she keeps switching it up, there's nothing wrong with taking parts like this, I think. Have yet to see The Sitter, and I'm not sure if I ever will. It's not a Jonah Hill thing, though. It just doesn't look a film I'd enjoy. Moving right along, I’m basically copying and pasting what Candice said about Bridesmaids. The marketing gave a very Hangover vibe, but people who see the movie know that there’s much more going on with this chaotic group of women than with any hungover Wolf Pack. Kristen Wiig channels the comedic skill she displays every weekend on "Saturday Night Live" into her lead performance, while also creating a fully fleshed-out character with dramatic undertones. The friendship between her and the bride-to-be Maya Rudolph feels genuine; it’s likely a reflection of their real-life relationship. There are also those deliciously under-the-rug moments of viciousness between Wiig and Rose Byrne, who plays a trophy wife with such brilliance. We can’t go without mentioning Melissa McCarthy either. She takes a stock character and makes her feel like someone we might actually know in real life. She’s also flat-out hysterical. It’s unfortunate that many are taking such an issue with her possible Oscar candidacy. People often complain about undeserving Oscar bait making the cut. When a highly deserving performance that lacks Oscar pretention, though, comes along and gets hype, people can’t be happy about it. With all of that behind me, I feel like it was a great year for female roles in other features as well, like Young Adult, The Girl with the Dragon Tattoo, and The Help. I’m not going to take up any more space with that last film, but I’ve got plenty to say about the other two films. It’s awesome that we’ve got a movie like Young Adult, where the leading female protagonist is as mean and unlikable as can be. You don’t see it often: men do it in comedies all the time, and everyone laughs along, but when a woman does it, the question of “Why can’t she be nicer?” is immediately raised. I think that’s what’s sadly killing this movie’s chance at finding a big audience, but more power to the duo of Diablo Cody and Jason Reitman for bringing this story to the big screen and maintaining artistic integrity instead of sucking up to the mainstream with a watered-down version of Mavis Gary. Regarding Charlize Theron, she was dynamite. I never knew she was so skilled with comedy, particularly comedy of such a dark nature. I’m crossing my fingers that she gets more love this awards season, though I’m not counting on it. Now I’ve come to The Girl with the Dragon Tattoo. Many already view protagonist Lisbeth Salander as a feminist icon thanks to Stieg Larsson’s novel, from which the film inspired. After seeing David Fincher’s adaptation and Rooney Mara’s commanding lead performance, it’s impossible to see the character as anything else. Mara's so terrific and nuanced in the role that she disappears into the character. The same goes for Michelle Williams in My Week with Marilyn, even though she really doesn't look much like Marilyn Monroe at all. Coming back around to The Descendants, which Brian mentioned earlier, I think it's a very good film, but I also agree that it's highly overrated. It's a good blend of comedy and drama, but whenever people start talking about the film as poignant or being a masterpiece, that's where the praise stops for me. It's a solid film and nothing more. Perhaps what's most offensive is that Alexander Payne uses Altman-esque long shots when they add nothing to the story or narrative. Also, throw me into the camp that doesn't get why Shailene Woodley's performance is receiving such raves. She's quite good, and I'm sure that she'll have a great career, but it's a role that any other decently talented actress in her age range could have played. I'm glad Candice and Sean liked The Hangover Part 2, but I won't go near that film. It's appearing on many critics' worst of the year lists, and I wasn't a huge fan of the original, so the same movie a second time is not my idea of a good time. That being said, after reading about what all three of you thought of Young Adult, I've decided that I am going to check that one out tonight. I loved Juno, so I do look forward to another Cody/Reitman reunion, though, from what I've heard, Young Adult is much darker than Juno, but I like dark comedies if they're done well. I also look forward to seeing The Girl with the Dragon Tattoo, even though it's almost 3 hours long and I really didn't like the Swedish film. Ironically, my dislike for the original film makes me more excited to see Fincher's movie since his almost has to be better in comparison. I really loved Rooney Mara in The Social Network, and The Social Network was my number one film of last year, so I'm totally on board for The Girl with the Dragon Tattoo...that is when I have three hours to kill and I want to spend them with depressingly bleak subject matter. I did really enjoy Bridesmaids. It reminded me of another film that I think is underrated...My Best Friend's Wedding. It's a comedy that's not so much about raunch as it is about relationships and intelligence. I'm not quite getting the Melissa McCarthy Oscar buzz, though. She's fine, but she's a little cartoonish in it. I mean, I wouldn't think of nominating Zack Galifianakis for The Hangover, and McCarthy was pretty much the female version of his character. I really don't think she'll be nominated. I think people like her personality off screen, which translates into the Oscar buzz. I think McCarthy deserves a movie career, and if she's as talented as many think she is, she'll have her chance at a nomination for a role in which she's deserving. Wiig, on the other hand, was tremendous in Bridesmaids. 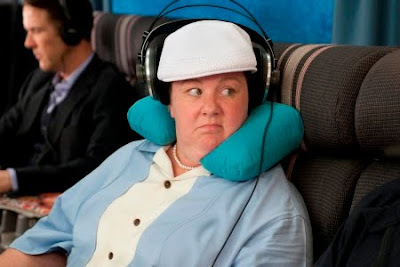 She's one of the great comedic talents around, and Bridesmaids was the perfect vehicle for her. Similar to My Best Friend's Wedding, Wiig wasn't afraid to make her character pretty unlikable at times. There are some truly uncomfortably funny moments in Bridesmaids involving Wiig's character, and she totally nailed every single one. I don't think she will be nominated for Best Actress, but if she does, it'll be very deserving. Speaking of comedies, I just saw The Artist, and it's really wonderful. I teach a high school film course, and we spend a good amount of time talking about the silent film era. We watch Murnau's Sunrise: A Song of Two Humans from 1927, and we concentrate on Keaton and Chaplin later in the course. The Artist feels totally authentic to that time period. The performances are wonderful, and it's visually stunning. However, I'm confused regarding the intentions of the film. Is it supposed to be an homage? If so, it doesn't really fall into that category because there's no sense of honoring another person's work or any type of meta-nostalgia. It's a straightforward silent movie that fits alongside others from the era. Is it supposed to introduce the world of silent filmmaking to modern filmgoers? If so, then I don't think it'll be much of a success in that regard. It feels as dated as every other silent movie ever made. Unless a person is used to the world of silent movies, then he or she will probably have to appreciate The Artist from an emotional distance. Therefore, I'm left to think that it's simply meant to be as a straightforward slice of entertainment, and as such, I personally loved it, but I can't bemoan anyone else who was bored or disengaged. Also, it's not as good as some of the best silent films like Sunrise, City Lights, Modern Times, The Passion of Joan of Arc, Broken Blossoms, The General or The Cabinet of Dr. Caligari (among many others). In other words, I feel like I enjoyed The Artist because I'm already used to silent movies. I find it highly unlikely that most people today will respond as favorably to it as I did. Midnight in Paris was another comedy that I really enjoyed. Woody Allen makes way too many movies, and as such, there's a sense that sometimes he lucks into a gem like Midnight in Paris or Vicky Cristina Barcelona or Match Point. Lately, for every good movie he's made, he's made two or three stinkers. Therefore, I don't consider Midnight in Paris as one of his masterpieces simply because it does feel like he lucked into it. That being said, it's a wonderful film, and I'm sad that Owen Wilson isn't getting much buzz for his excellent performance in the lead. Midnight in Paris is one of the more breezy and delightful movies that has come out in a long time. If anyone doesn't smile throughout that movie, then I'd be worried about his or her mental health. Allen's typical pathos is dialed down for sincere nostalgic longing to a period that even predates his own life. Midnight in Paris is one of the few 2011 releases that I see myself revisiting on a regular basis. It's a real gem.